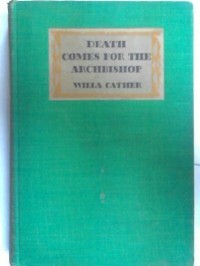 Michael Dirda has an essay in Classics for Pleasure on Willa Cather that focuses on this book. That and the gentle prodding of two GR Friends convinced me to give this author another chance. I had been "traumatized" in a high school English class reading My Antonia and had never quite recovered. I don't blame my teacher. I wasn't forced to read the book except insofar as he gave us a list of "great American literature" and told us to choose a book and write a paper on it. As the crusader knight in "Indiana Jones and the Last Crusade" opines: "He chose poorly." My own life experiences at the time ill prepared me for what makes Cather an important writer; unfortunately, it was just another boring assignment best finished as soon as possible. As you might deduce, I have much warmer feelings for Cather now than I did 20+ years ago. Though I'm not going to rush out and devour everything else she's written, I thoroughly enjoyed reading Death Comes for the Archbishop. It's a loosely structured collection of anecdotes that chronicles the missionary activities of two French Catholic priests - Jean Latour (the "archbishop" of the title) and his close friend and vicar, Joseph Vaillant - in the newly established diocese of Santa Fe. The year is 1848, when the US has taken the territory from Mexico, and the spiritual condition of the region's priests and parishioners is deplorable. Over the next 40 years, the two men re-energize their congregation and are continually reaffirmed in their faith. Though friends, Fathers Latour and Vaillant couldn't be more different - both physically and mentally. Latour is aristocratic and often uncomfortable associating with his desperately poor and ignorant flock; Vaillant comes from peasant stock and enthusiastically throws himself into the ministry. Both men come to love deeply both the land and the people; a love returned by their charges. While not a "slow" or "long" read (it's only 299 pages in my edition), I found it a "calming" read. Even in the most "active" parts such as "The Lonely Road to Mora," where Latour and Vaillant barely escape the murderous attentions of a scoundrel and rescue his abused Mexican wife, there's a quiet rhythm to the story that carries the reader along. This passage from "Eusabio" both reflects what I'm trying to convey and describes it (if one equates "Indians" with the book as a whole): ...Indians going to and fro on the long winding trails across the plain, or up into the Sandia mountains. They had all of them the same quiet way of moving, whether their pace was swift or slow, and the same unobtrusive demeanor... (p. 235). There were several passages that particularly impressed me while I was reading. The first comes in "The Miser," where Cather takes the opportunity of the death of a parish priest to observe the sacral nature of traditional beliefs about death. And by "sacral" I don't mean anything specific to a particular religion but rather the idea that death is a moment when the soul made its entrance into the next world, passing in full consciousness through a lowly door to an unimaginable scene, rather than simply the moment when certain bodily organs ceased to function (p. 170). Probably the most difficult part in reading this book was empathizing with Latour or Vaillant. I'm not by any stretch of the imagination religious - I fear I have lapsed far from my Catholic heritage - and getting into the heads and motivations of these characters could be difficult. For example, a cynic could easily read Vaillant's constant trolling for contributions as a crass effort to bilk the peasants of what little wealth they possessed. There were, however, passages that helped me. The one I have in mind is in "Auspice, Maria! ": It was just this solitariness of love in which a priest's life could be like his Master's. It was not a solitude of atrophy, of negation, but of perpetual flowering. A life need not be cold, or devoid of grace in the worldly sense, if it were filled by Her who was all the graces... (p. 256). And then there's the final, deathbed scenes, including: More and more life seemed to him an experience of the Ego, in no sense the Ego itself.... The mistakes of his life seemed unimportant; accidents that had occurred en route... (p. 290). Of course, no review of a Cather novel is complete without some mention of her powerful descriptive ability. I've been to New Mexico and I didn't see half of what she saw (alas). From the first few pages, Cather paints word-pictures that vividly put the reader into the scene: The Cardinal had an eccentric preference for beginning his dinner at this time in the late afternoon, when the vehemence of the sun suggested motion. The light was full of action and had a peculiar quality of climax - of splendid finish. It was both intense and soft, with a ruddiness as of much-multiplied candlelight, an aura of red in its flames. It bored into the ilex trees, illuminating their mahogany trunks and blurring their dark foliage; it warmed the bright green of the orange trees and the rose of the oleander blooms to gold; sent congested spiral patterns quivering over the damask and plate and crystal (p. 4). There's another passage where Cather describes a sunrise illuminating snow-covered mountains but I neglected to mark it; you'll have to trust me that it's a glorious description. A final thought: There's a powerful element of nostalgia and grief over lost traditions and the destruction of nature. Latour, in particular, recognizes the worthiness of civilization, after all his Church is a product of it and the cathedral he eventually erects, a symbol, but he rues the loss of simplicity and the natural rhythms along which life runs: Beautiful surroundings, the society of learned men, the charms of noble women, the graces of art, could not make up to him for the loss of those light-hearted mornings of the desert, for that wind that made one a boy again. He had noticed that this peculiar quality in the air of new countries vanished after they were tamed by man and made to bear harvests.... The moisture of plowed land, the heaviness of labor and growth and grain-bearing, utterly destroyed it; one could breathe that only on the bright edges of the world, on the great grass plains or the sage-brush desert (p. 275).